Prime Minister Narendra Modi on Sunday asked the states to consider advancing the financial year to January-December, saying that in a country where agricultural income is exceedingly important, budget should be prepared immediately after its receipt for the year. Making the observation while delivering the closing remarks at the third meeting of the Governing Council of NITI Aayog here, he said there have been suggestions to have the financial year changed to January-to-December -- in place of the existing April-to-March -- and urged the states to take the initiative in this regard. 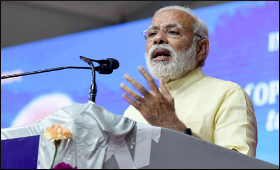 The Prime Minister said that because of poor time management, many good initiatives and schemes had failed to deliver the anticipated results. He also reiterated the idea of holding simultaneous parliamentary and state assembly elections, saying that the country had suffered from economic and political mismanagement for long now, and that a constructive discussion had already begun on the subject. "The Prime Minister said if the elections are held simultaneously, then political parties could just focus on them once in five years and then use the rest of the period to do serious work," NITI Vice Chairman Arvind Panagariya told reporters after the meet. Modi also called upon the state governments to work with the Centre as to build "the India of the dreams of our freedom fighters" by 2022, the 75th anniversary of Independence. He urged states, local governments and all government and non-government organisations to decide goals for 2022, and work in mission mode towards achieving them. He called upon the states to use the GeM (Government e-Marketplace) platform to reduce corruption and increase transparency in government procurement, adding that the use of technologies such as BHIM and Aadhaar would result in significant savings for the states.